1 Rinse chives, shake dry and cut into small rings. 2 Cut beef into slices 1 cm (approximately 1/3 inch) thick, trimming fat as necessary. 3 Peel carrots, trim celery and cut into sticks 1.5 cm (approximately 2/3 inch) thick. Blanch carrots and celery in boiling salted water until al dente, about 4 minutes. 4 Rinse and trim scallions, cut in half crosswise and blanch in boiling salted water about 3 minutes. Drain all and pat dry. 5 Soften gelatin sheets in cold water. 6 Boil beef broth and vinegar essence, season to taste with salt and pepper and allow to cool slightly. Squeeze gelatin sheets well and stir into broth mixture with half of the chives. Cool broth to lukewarm. 7 Line a gelatin mold with plastic wrap. Arrange a third of the carrots, celery and scallions in bottom of mold and pour in enough broth to cover. Place a layer of beef slices over vegetable layer. Repeat layering twice, finishing with beef slices on top, being sure to use enough broth so finished layers will set together. Cover mold with plastic wrap and refrigerate at least 3 hours to set. 8 For the radish salad, rinse and trim radishes and cut into thin slices. Pour oil and vinegar over radish slices and season with salt and pepper. 9 For the fried potatoes, cut potatoes into slices and sauté in hot oil until golden brown. Season potatoes with salt and pepper. 10 Turn aspic out of mold and remove plastic wrap. Briefly dip a sharp knife in hot water and cut aspic into slices. 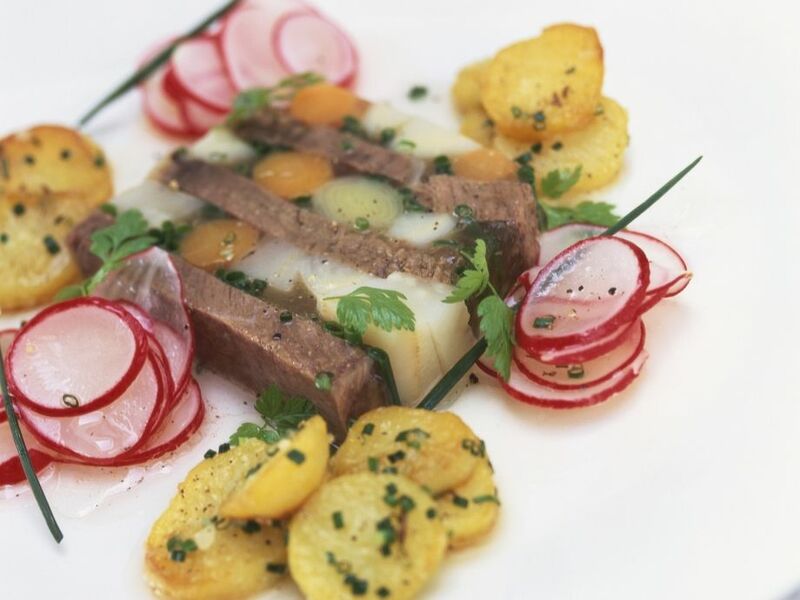 To serve, arrange aspic slices on plates with radish salad and fried potatoes. Dribble marinade from radish salad over aspic slices. Sprinkle with chives and garnish with chevril as desired. This recipe hasn't received any comments yet. Have you already cooked this recipe? This recipe has no ratings yet.